This recipe comes courtesy of Cheryl Wakerhauser, of Portland's Pix Patisserie. 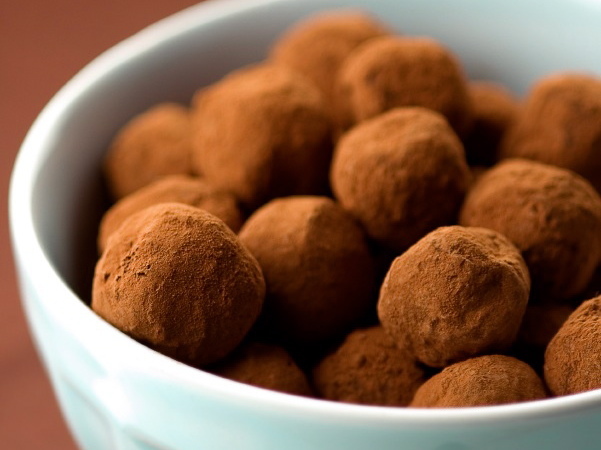 Read more about homemade truffles in Melissa Lion's article "Chocolate city." Put the 8 ounces chocolate in a dry glass bowl and microwave in short bursts, stirring thoroughly in between, until 80 percent of the chocolate has melted. Stir to melt the remaining chocolate. Put the cream in a small saucepan and bring to a simmer. Pour ¼ cup of the hot cream over the melted chocolate and stir with a spatula until incorporated. (The chocolate may appear grainy.) Add the remaining cream in ¼-cup batches, stirring well with each addition. When the cream and chocolate are fully incorporated, place the bowl in the refrigerator. Leave for four hours, or until the mixture has cooled and slightly hardened. Using a small spoon, scoop bite-sized pieces of the ganache into a small pan. Place pan in the freezer overnight. Put 6 ounces of the dipping chocolate in a dry glass bowl and microwave in short bursts, stirring thoroughly in between, until 80 percent of the chocolate has melted. Stir to melt the remaining chocolate. Dip the balls of frozen ganache into the chocolate in small batches. Remove when covered in dipping chocolate and roll the dipped pieces in the cocoa powder and/or the nuts. Set aside on a clean plate. Continue working in small batches; when you need more dipping chocolate, melt the remaining 6 ounces of chocolate. Once the dipping chocolate has hardened and the ganache has lost its chill, serve and enjoy. Truffles will keep in the freezer for several weeks. Defrost in the refrigerator or at room temperature before serving.